Dickey Boats has done it again with this custom-designed and built Dickey Semifly 32. This aluminium cruiser is all about innovation, performance and style of the highest order. It was only two years ago that I last had the pleasure of reviewing a Dickey Semifly 32, called Tribal. Today, Dickey Boats has found more ways in which to improve on that level of excellence with this new Semifly 32, Matua. Browse our boat test database to find more Dickey boat reviews. The attention to design, detail, innovation and commitment to quality earned Dickey Boats top honours and overall dominance (four gold awards) at the 2014 Hutchwilco Boat Show. 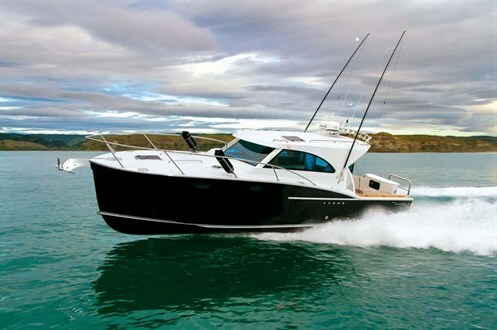 And not forgetting the Dickey Custom 850 was named one of Trade-A-Boat’s Kiwi Kings in the same year. Beneath the glamorous finish of the Dickey Semifly 32 lies the heavy-duty Dickey Boats Space Frame Interlocking System – as impressive to see in build as it is to ride on. Encased in a 6mm aluminium hull, this unyielding structure provides benefits that range from a soft and quiet ride to considerable storage beneath the saloon floor. The plumb bow’s razor entry also maximises internal volume and extends the waterline length, allowing the Dickey Semifly 32 to offer a ride that’s usually reserved for 12m launches. On board, exquisite attention to detail and touches of class feature throughout, such as Corian table and bench tops surrounded by luxurious and tastefully coloured upholstery. Relaxing in the helm seat offers expansive views and an extensive Garmin package consisting of twin 8012 MFD touchscreens, autopilot and radar put a wealth of interchangeable information at your fingertips. 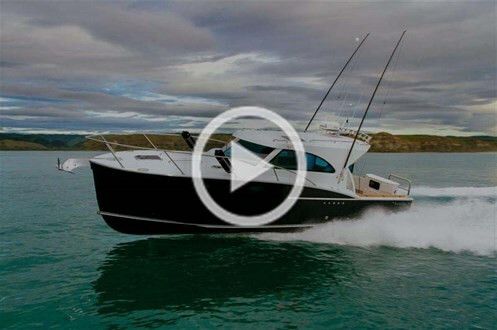 Check out the video to see the incredible customisation on this Dickey Semifly 32. By integrating Mastervolt’s CZone system, each Dickey Semifly 32 can now be fine-tuned to suit your mood with the mere touch of a button. 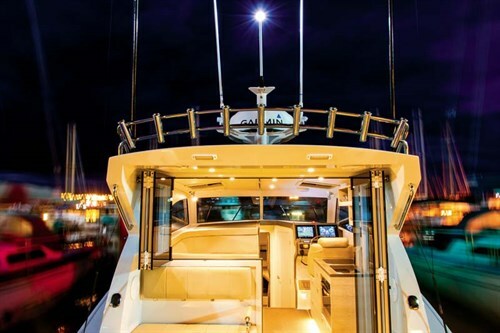 Controlling everything from the tuna tubes to dimming the lights can be easily accessed via the twin Garmin 8012 touchscreens or an app on your iPad or iPhone. "CZone is now standard on our launches," said managing director Jason Dickey. "The entertainment system, the electronics and the engine are all integrated and it’s seamless. It’s a very well-refined system now which works brilliantly." 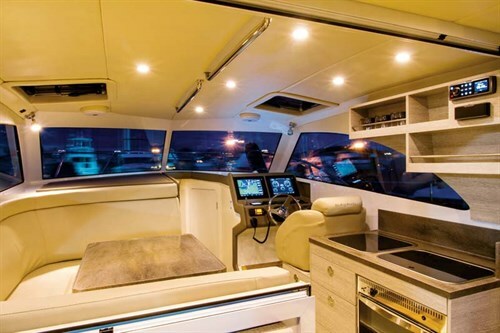 Individual modes are preprogrammed to suit the owner’s taste in boating and these include customised settings for cruising, docked, anchored, gamefishing and bottom fishing. Selecting the required mode instantly powers on the required features with minimal fuss. At the end of a voyage, just press a button and the boat will shut itself down as you step off. Sliding open the bi-fold door and rear window creates a seamless flow between the cockpit and saloon for chilled sundowners. Dek-King synthetic teak flows from the cockpit through to the helm for maximum versatility and ease of clean-up, without sacrificing comfort or visual appeal. The backrest of the lure-watching seat is also removable, revealing a lift-up servery for refreshments. A few steps below lies the spacious bathroom with a walk-in shower. The Dickey Semifly 32 sleeps six beautifully, with comfortable abodes and custom-made inner sprung mattresses for home comforts at sea. The forward bunkroom and separate master cabin design also offers versatility for a family or accommodates up to four mates on extended fishing getaways. 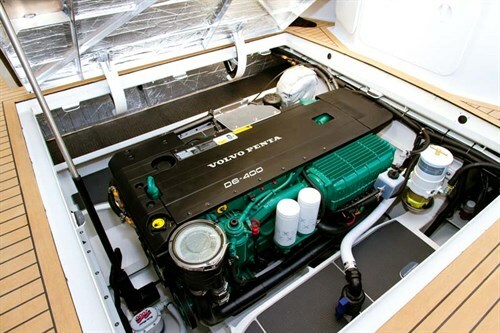 The press of another button opens the cockpit floor to reveal the easily accessible Volvo Penta D6-400. 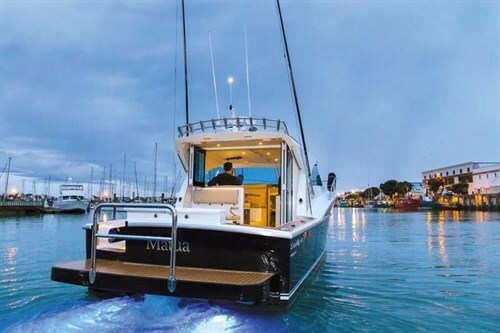 Matua’s owner opted for the maximum rated power plant – the first 400hp installation in a Semifly 32. Interestingly, a comparison of the performance/economy figures from recent tests reveals little variation in fuel economy. The D6-400 at 3000rpm gave 25.5kts using 2.01lt/nm, while the D6-370 at 3000rpm offered 25.5kts using 1.97lt/nm. But the 400hp offers extra punch and another 2kts at WOT (33.2kts vs 31.2kts). Both options, though, will provide an exceptionally smooth and quiet drive. With its stunning finish, exceptional functionality and timeless style the Dickey Semifly 32 is much more than a boat, it’s an elegantly crafted work of art. The Dickey Semifly 32 is a talented and stunning vessel that will perform as an aluminium fishing boat as well as a getaway cruiser. This Dickey boat certainly has refined elegance to cleanse the mind, body and soul. • I couldn’t fault this vessel! Dickey Semifly 32 price: POA. Each vessel from Dickey Boats is custom-designed and built to requirements.